An ode to the art of traditional bookselling and independent bookstores, this book offers lists of favorites that have flown under the radar, but off of bookstore shelves. First published on Hans Weyandt’s blog for Micawber’s Books, each check-list style contribution includes a bookseller’s top fifty books, anecdotes, and interviews about the life of being a bookseller, reader, and engaged citizen. Introduced by Ann Patchett, the book exhibits the range and diversity of these booksellers’ tastes and the stores in which they work. But it goes beyond a typical book of lists to show how independent bookstores are havens for readers where individual tastes, location, and personality matter and where the staff provide an expertise and wisdom about readers and books often lost in large and online retail spaces. One hundred percent of royalties will go to the American Booksellers Foundation for Free Expression (ABFFE). Notes: A special panel discussion with Sheryl Cotleur of Book Passage, Paul Yamazaki of City Lights, and Michael Barnard of Rakestraw Books on Read This! Moderated by John McMurtrie, book editor of The San Francisco Chronicle. Notes: Launch party for Read This! Handpicked Favorites from America’s Indie Bookstores. The book’s editor and co-owner of Micawber’s Books, Hans Weyandt, and Coffee House Press Publisher Chris Fischbach will talk about the evolution of the project from blog to book. Notes: Oscar Villalon, editor of Zyzzyva, will moderate a panel discussion with Michael Barnard of Rakestraw, Sheryl Cotleur of Book Passage, and Paul Yamazaki of City Lights Bookstore, in celebrate of Read This! 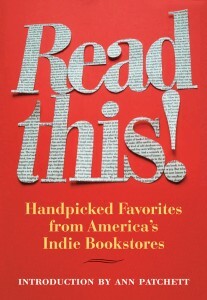 Handpicked Favorites from America’s Indie Bookstores.